Subject: Size of the octagon tiles? Played this for the first time today with a friend who is a mad max nut. He loved it, we all enjoyed it. The board could use a frame, I'd like to make him one. I couldn't whip out a measuring tape at the table, it would spoil my surprise. 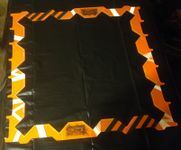 Also, my instinct is to cut it from transparent orange acrylic ... and leave the tan backing on the bottom side so its a grungy orange no matter what table it is on. But I could see an argument for red or neon green... even a blue or purple. It's a very colorful game. Any thoughts re: color? Don't forget that the outposts stick out from the sides along the edges when you build your frame. Seems like a complicated shape but could look really awesome. Don't forget that the outposts stick out from the sides along the edges when you build your frame! Yes, was already accounting for those projections. This will be fun! Giving it the high gloss treatment. Next Sunday I'll gift it away and get an in-game action shot! Agreed! Is this something you could/would be willing to post to an appropriate maker site so others could get some? I quite enjoy the game, but I've only played it on a gaming mat that I don't own, and I just know it's going to go everywhere on the next table I use it on. Did this work out? Pics of the full setup? Would you be willing to sell additional frames? Yes, it was a hit! Friends loved it and have played add'l games with it. There was an error, tho, I included space for base tiles at the corners, but the game setup doesn't call for bases at the corners ... maybe some variant or expansion will, so I can pretend it was intentional. If there is interest I could post a listing for it on Etsy. But it would have a 2wk lead time (I don't often have a need for fluorescent orange acrylic! ), and I would offer it plain, w/o etching, paintfill, or clearseal. If people are interested in the frame with the etching, I would have to remove the logos, as I don't have rights to that art.